Welcome to the online home of The Zynq Book! 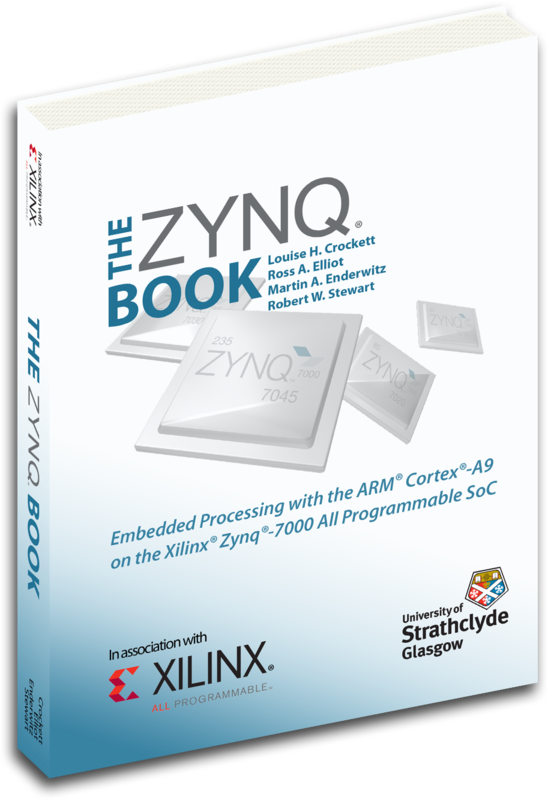 The Zynq Book is all about the Xilinx Zynq®-7000 All Programmable System on Chip (SoC) from Xilinx. 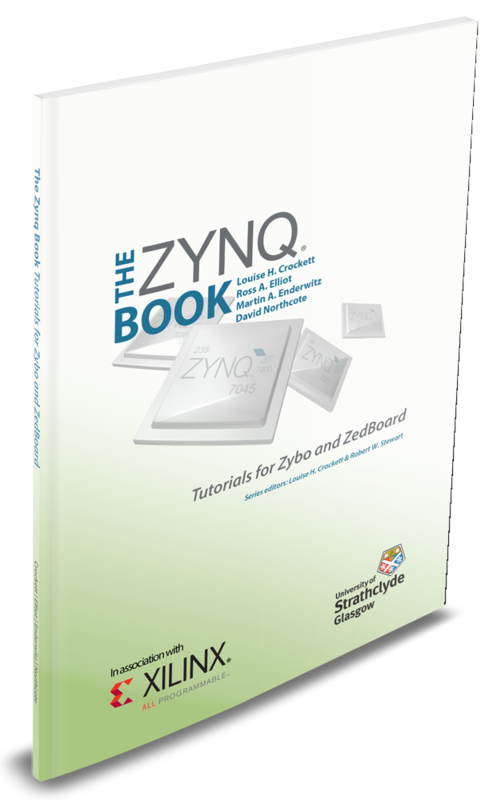 This is the online home of The Zynq Book, designed to raise awareness of the book and host the accompanying tutorials. Thanks for finding us! The Zynq Book is the first book about Zynq to be written in the English language. It has been produced by a team of authors from the University of Strathclyde, Glasgow, UK, with the support of Xilinx. We wanted to create an accessible, readable book that would benefit people just starting out with Zynq, and engineers already working with Zynq. We hope that it will prove a handy reference that remains on your desktop! You can find out more about the book’s contents on the About page. 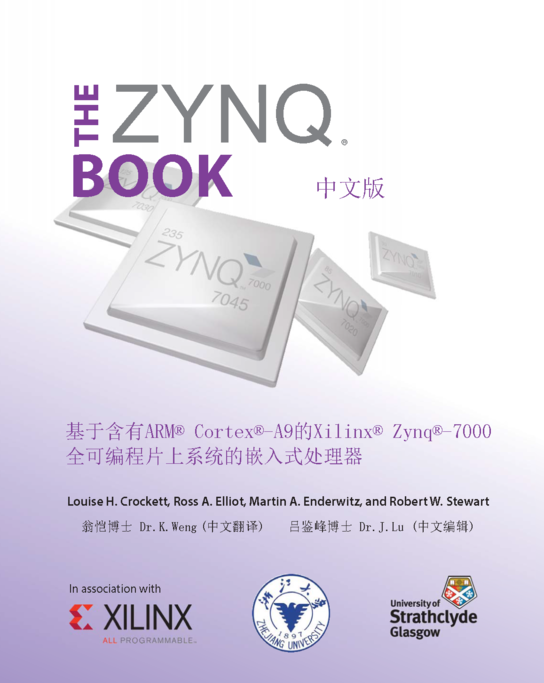 The new Chinese edition of The Zynq Book is available now. Download a free pdf copy here, or purchase a printed edition from Amazon. The book comprises 24 themed chapters, and is printed in full colour throughout (including over 150 figures). It is available internationally for a suggested price of $35 (US), £27.50 (UK), €35 (Europe), and similar prices in other countries&ast;. The Buy page provides more details about how to obtain your copy. You can download a free pdf copy of the Zynq Book from the Book Download page. Tutorials now available for Zybo and ZedBoard! Tutorials are now available supporting both the ZedBoard, and the lower cost Zybo development board. You can purchase a full colour printed edition of the Tutorials from Amazon and other retailers, for $14.95 (US), £12.50 (UK), and €16.50 (Europe)&ast;! See the Buy page for more details on the print copy, or the Tutorials Download page to obtain a free PDF ebook version. &ast;We have regrettably been forced to increase the price slightly due to increased costs from our Print-on-Demand partner, which we are unable to absorb. We hope you will enjoy The Zynq Book! If you would like to get in touch with us with questions, feedback etc., then please use the Contact form – we look forward to hearing from you!